Minister Teddy Van Vale felt the call of God on his life for many years. He began answering that call in 1984 by using he gifts and talents that God had given him through music. He leads music and worship services, presents concerts in the Topeka area and also conducts ministry outreach at prisons, nursing homes and on indian reservations. Minister Van Vale has partnered on many occasions with many groups such as Promise Keepers to carry out the Great Commission according to Matthew 28:19-20 "....go and make disciples of all nations, baptizing them in the name of the Father and of the Son and of the Holy Spirit, and teaching them to obey everything I have commanded you. And surely I am with you always, to the very end of the age." In the 1970's Teddy Van Vale played on Stage with BBKing for around a year and 5 months, then a year later played again for another 5 1/2 months. He was also the leader of a rythym and blues band called "The Teddy Van Vale Experience. He also played on stage with the Staple Singers. For years, Minister Van Vale felt that God would provide a place for his group to meet. Several years ago, when cleaning out a Topeka office building with a work crew, Minister Van Vale was asked to get rid of about 100 office chairs. His reply to the project supervisor was "Would you mind if I took them home? I might have use for them some day." The opportunity arose when Christian Lord Ministries acquired an abandoned one-story home across the street from Highland Park High School at a reasonable price. Since that time, much work has been done on both the interior and exterior of the property to make it useable. Christian Lord Ministries' location across the street from Highland Park High School fits nicely into Minister Van Vale's vision to expand the ministry by reaching out to Shawnee County youth. As he put it "God said that he would make us fishers of men. Well, He has placed us right across the street from a big fishing hole." He loves the Lord with all of his heart. He has the desire to spread the gospel of Jesus Christ to anyone that will listen. "We're not here to condemn anyone or even tell them what their problem is, we want to tell them how good God is," says Van Vale. Along with his wife Diane, their desire is to do the will of the Lord in their lives. Jesus said that "the harvest was plentiful but the workers are few". These faithful servants have answered the call of God and will remain faithful. Van Vale is a visionary. 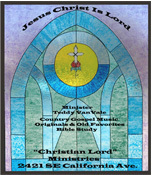 Plans are underway to expand the ministry to reach lost souls for Christ.